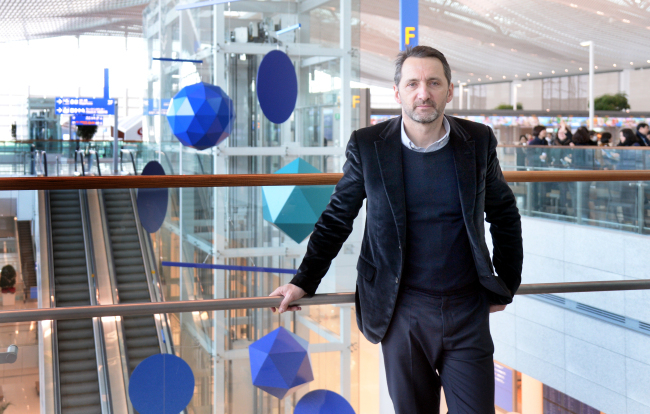 Adding poetic elements to the public space was French artist Xavier Veilhan’s goal in creating “Great Mobiles” installed at the entrance of Incheon Airport’s Terminal 2. Veilhan is best known for his angular sculptures, as well as “Studio Venezia,” a giant recording studio that transformed the 1912 French Pavilion, introduced at the Venice Biennale 2017. “Great Mobiles” consists of two mobiles that stretch 18.5 meters wide, hanging near the two entrances of the newly built second terminal. The French artist’s work is one of the major works commissioned by Incheon International Airport Corp. as part of its “Artport” project aimed at turning the airport into a place that can provide an exceptional experience. “It’s a great opportunity to include my work in this public environment. I wanted to bring my work into the real-life,” Veilhan said during a press conference Thursday at the new terminal. For Veilhan, who represented France at last year’s Venice Biennale, it is important for his artworks to become part of the surrounding environment, as well as the people around it. Veilhan said he always takes extra care to organize exhibitions that can make the audience feel their own existence, rather than having them be overwhelmed by the artworks or merely appreciate them. “(For the project), I wanted to make something that is large scale but modest. Something that is impressive but not imperialistic,” he added. The artwork and its ever-changing mobility are well-suited to the airport, the artist says, as a lot of people are constantly moving around. “I wanted the mobile to be always changing, different at every moment. The work is about the movement and change,” Veilhan said. “There is an aspect of traveling that is about a project of yourself -- (a) project of going somewhere, and being taken out of your context. These are the fantasies that travel can bring. But they are little bit erased by the banality of traveling today. What I am interested in is to bring back the experience of traveling into something that is more linked to poetry,” Veilhan said. In “Great Mobiles” Veilhan employed both digital technology and traditional ways of making sculptures, such as molding. The artwork’s movements were computer simulated before his team arrived to install it.